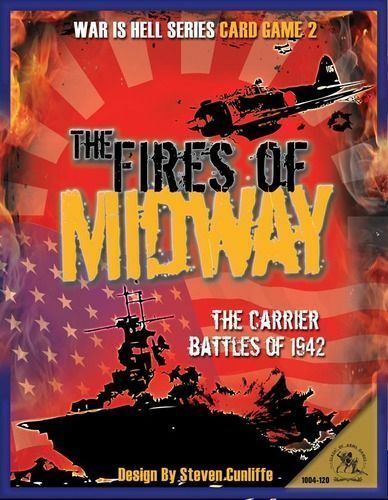 The Fires of Midway WW2 card game is now available. FoM is the second game in Clash of Arms’ War is Hell series. FoM covers Pacific carrier warfare including not only the Battle of Midway but also the battles of the Coral Sea, Eastern Solomons and Santa Cruz. It is a two player game but also includes official rules for solitaire play. We have had a read through the rules but have not played a game yet. Physically the game is similar to the Hell of Stalingrad game. Unfortunately this means it has the same sort of garish, over designed graphics. But the presentation is functional and the historical photos of the various ships and aircraft are nice. Movement is done on a side map, search is conducted by drawing cards, and combat is performed through card play and dice rolls. All of the major facets of WW2 carrier combat are covered. Overall the game looks very interesting and we look forward to getting in a game. BoardGameGeek has PDF versions of the rules and tables available for download. This entry was posted in Board Wargames, Naval Warfare, News and Updates, WW2.